I think we can work on pushing the pace a little. “I think we can work on pushing the pace a little.” I was tempted to email my coach back and tell her a short story about this time Adam and I needed to get from Point A to Point B (our car) in a bad rain storm. I love running, I love it so much. I don’t know if I will love running at a speed that is out of my comfort zone. For me, up until this point, it’s been all about pushing to new distances and focusing on crossing the finish line. I guess this is just a new running challenge and I think I will end up liking it in the end. Plus, I may have specifically requested to bring my pace down for my second half in Feb. I am excited about building mileage again! While I was preparing for the Fort Lauderdale half there is no doubt that every run in the double digits was a struggle. I really hope with a proper fueling strategy this time around I can get through miles 10-13 with grace instead of a grimace! Sort of off topic (okay way off topic) but I finally decorated my office at work. 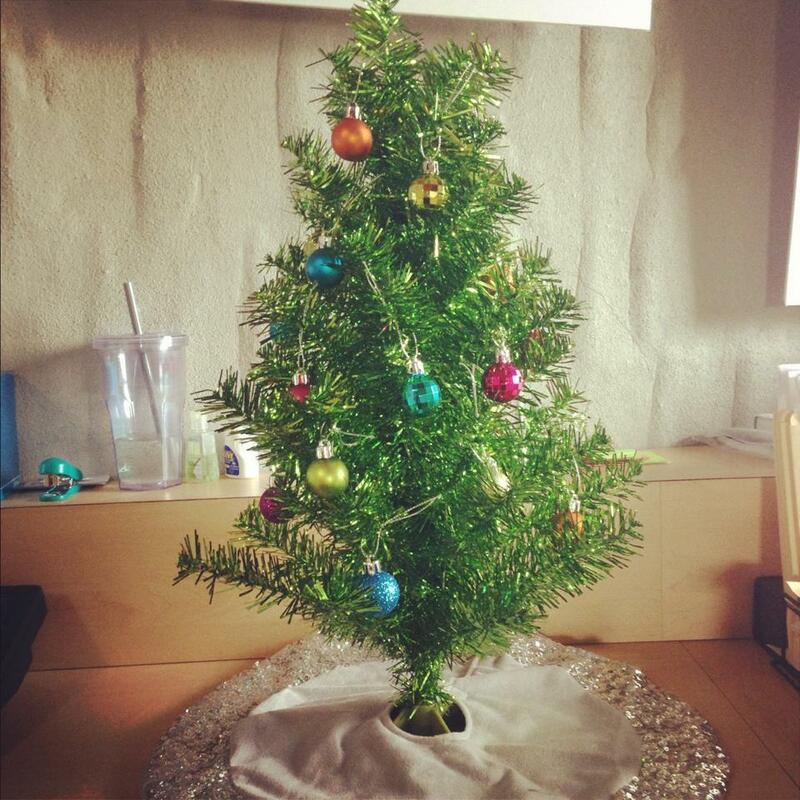 And by “decorated” I mean I pulled out the mini tree I bought last year and placed it on my desk. I got the tree, skirt and ornaments last year at Target for less than $20 total! The most expensive part was the skirt which was $8 but I think it was worth the investment. We don’t put up a tree at home because Cecil loves to climb up everything he possibly can. I just know he would love to climb a Christmas tree and knock down all the ornaments. I want him to be happy but not that happy. Plus we live on the 3rd floor of our condo complex so that presents difficulties. Maybe we’ll give it a try next year when we’re in a house (fingers crossed). How often do you do speed work? What kind? – I’ve heard interesting things about those Yasso 800s! Do it! Work on speed. You only have to do it once or twice a week and the best part? You are allowed to WALK or at least jog really slowly between your intervals. Your legs will be sore, but you will feel pretty much like a bad-a$$ that night. Plus, intervals really tone you up. I am SO ready to feel like a badass for the first time in my life!! 🙂 You’ve convinced me that this will be a good thing! I’m excited to get to see how your speed workouts work. I’m generally a pretty slow runner. I’d much rather just go out and plug away at a pace comfortable to me than hate running the entire time because it’s fast. But it’s all about getting your body used to another thing, I guess, so I know it’ll go great! Hi Bree, I am exactly the same as you. I love just getting out there at a comfortable pace, but hopefully soon-ish I will have a new comfortable pace 🙂 I will let you know how it goes! 18 miles on Sunday with 3 sets of 5:00 at 5k or 10K race pace. You will see big gains in your race times. Hi Bryan, thanks so much for sharing your workouts with me! It’s very helpful to see what you/others are doing! I need to go back to speedwork, and I plan to once volleyball ends. I really enjoy it. It’s weird, because getting faster feels very rewarding, but it can also take some of the joy out of running. I think with a coach, you’ll go about it the right way! I love Yasso 800s — well, love/hate. They hurt when I’m doing them but they really do help boost my pace! Haha yes, I’ve heard lots of people say it’s a love/hate relationship!